There are many things we have to think when our dog’s health is at stake, but somehow we always overlook their eyes health. If you want to solve some of the problems your dog could have with eyes, these 10 best dog eye care products will help you with that. 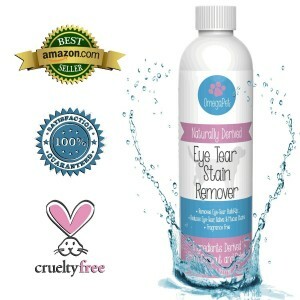 This is an all natural version of the original angel’s eyes tear stain remover, and it is made in USA. Every packaging includes measuring scoop and 150 grams of this product with natural chicken flavor. It is not advised to use it on pregnant animals or animals who breastfeed. And if it’s not effective on your pet friend, then you should consult your veterinarian for advice. It’s safe and non toxic solution for your pet. It is used to clean and relieve affected by stinging, itching, burning, irritations and all other problems you pet could have with its eyes. It doesn’t contain alcohol, steroids, antibiotics and your dog will feel happier and better after this solution. You don’t have to worry if your dog licks it. 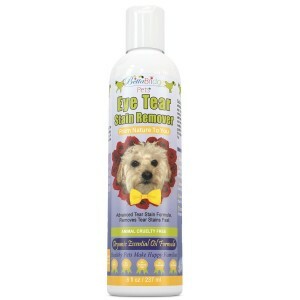 Noah & Tilly made this tear stain remover with twist top dispensing nozzle for easy use. It is very gentle, effective and kind so you don’t have to worry about the consequences. Made in use, this product is naturally derived, with all natural ingredients made out of coconut and palm, and it is fragrance free, so no need to worry about sensitive nose of your pet. If you start using this product it is good to know that you have a lifetime guarantee, if you or your dog aren’t completely satisfied, you will have you money back. Optixcare eye lube will help your dog with its eye problems. It has thick consistency, very easy to apply, and your dog will feel relief. It is specifically formulated for use on dogs, and even cats, and it used as an ocular lubricant. After it’s applied, Optixcare becomes clear and rapidly disperses across your pet’s cornea, providing protection and lubrication. Your dog will feel safe and healthy, and have excellent eye sight. This product is the one that you have to have in your medicine cabinet the most out of 10 best dog eye care products. It is safe if licked or ingested and you can use it on all animal species. It has no alcohol, no steroids, no antibiotics and it is also Non Toxic. Veterinarians recommend this product as one of the best eye care products for your pet friend. This particular product offer longer ocular surface residence and it is viscoadaptive clear solution with 0.25% hyaluronic providing effective, long-lasting and safe usage at and really affordable price. This product is blink activated and your dog will feel instant relief with this drops. Not a one bad thing from customers, so you know it is a good remedy. You want for your dog to have clean and pretty eyes, and you can help you pet to have it with OmegaPet tear stain remover. It works really fast, even though it has gentle formula, making your pooch happy and tears stain free. It works great on colored dogs such Poodles, Cocker Spaniels and Chihuahuas. 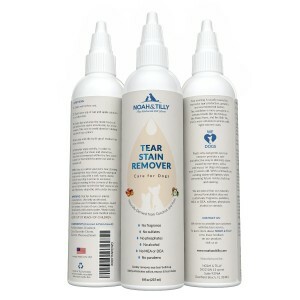 Made in USA, this tear stain remover is 100 percent cruelty free. It has premium quality and it is free from any parabens, sulfates, alcohol, antibiotics and steroids. Since it has twist top, it is very easy to use and you can control it with more precision. You don’t need to worry about effectives, if it doesn’t work, manufacturers guarantee money back. 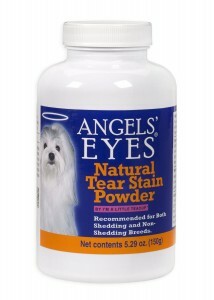 Since it is very effective and easy to use, your dog will love this stain remover. It is 100% all natural and it has natural ingredients including silver which destroys bacteria and fungus and also balances the pH in your dog. It has no chemicals, so you don’t have to worry about that and it is animal cruelty free. 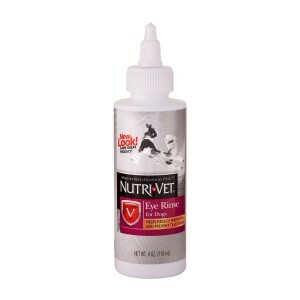 The last product on this list is Nutri-Vet Eye Rinse for dogs. It will help with irritation. This product gently cleanses the eyes and surrounding tissue and it will help relieve discomfort and pain. If your pet friend has eye infections, this solution will help in a fight against it. You should first remove excess matter from eye corners and apply 2-3 drops in each eye. If is important to take care of your dog’s health, as it is important to take care of your own health. With these 10 best dog eye care product you can keep your pet friend’s eye health at high level and you dog will be thankful to you. This is a small thing that you can do for your dog, but it will improve its overall health and you will feel happy seeing your best pet friend run around with no worries.